Most surgical procedures require administration of anesthesia – which is defined as a temporary, medically controlled method for a physician to control pain during a surgical procedure. Anesthesia is typically used to control a patient’s breathing, relax the patient, block pain, make the patient sleepy or forgetful, and even make the patient unconscious. It is estimated that as many as 46 million surgical procedures are performed annually in the United States alone. The physicians who administer anesthesia are referred to as anesthesiologists, and they often work in a team with a certified registered nurse anesthetist (CRNA). What is important to know is that the anesthesia team literally has your life in their hands while you are under anesthesia. There are many different types of anesthesia. General anesthesia is what we commonly refer to as being “knocked out” or “completely under.” When a patient is under general anesthesia, he or she is unconscious and unable to feel pain during the medical procedure. Once a patient is under general anesthesia, he or she experiences a sleep-liked state in which the brain does not recognize normal pain signals, muscle reflexes are lost, and the body has a decreased state of response. During general anesthesia, the anesthesia team monitors the patient’s vital signs and functions and controls or assists the patient with breathing. 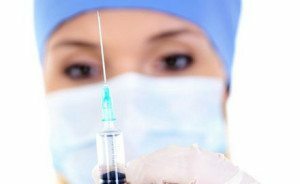 General anesthesia is typically administered by intravenous drugs (IV). Local anesthesia, is another form of anesthesia that is very common. In this type of anesthesia, the healthcare provider uses various types of medication to block the sensations of pain from a specific area of the body. This type of anesthesia is usually given through an injection into the skin or muscle surrounding the area of the body that needs to be numbed. Local anesthesia may also be provided together with other medications to help a patient relax, such as a sedative (sleep medication), which are often given intravenously through an IV. These are just some, but not all, of the more common causes of anesthesia errors. Mistakes in anesthesia often occur from a combination of errors. If you believe that you or a loved one has been the victim of an error from anesthesia, it is important that you speak to an attorney immediately. 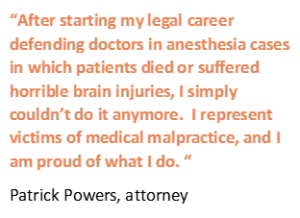 Our attorneys have experience in all aspects of medical error cases. Know your rights. 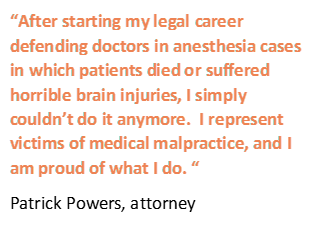 Call the experienced medical malpractice attorneys at Powers Taylor for a free consultation. All calls are confidential.